At Clean Air Act, Inc., we provide homeowners within our Oregon service area with free, in-home consultations for radon removal and radon abatement. During our visit, our radon specialist will conduct a Structural Analysis and Design Survey with you, where we'll detail everything you need to successfully mitigate radon in your home. While we there, we'll also answer any questions you have about radon, identify where radon may be entering your home, and work with you to customize a written cost quote for a radon mitigation system. We provide our radon mitigation systems for homeowners living throughout Greater Portland, including: Portland, Beaverton, Hillsboro, Gresham, Oregon City and cities nearby. What Are Radon Mitigation Systems and Who Can Install Them? At Clean Air Act, Inc., our radon exerts are trained in accordance with the highest industry standards in the proper installation of radon mitigation systems. 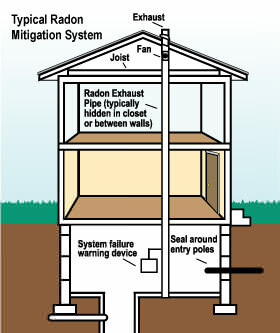 These systems are designed to pull radon from the home, expelling it safely outside. In addition to their training, each of our contractors is also fully licensed to perform all required radon services, and operates within full compliance of the radon gas industry's best practices. This ensures the highest quality solutions have been provided, and that the highest standards are implemented. The way your radon remediation system is designed will depend on multiple design components present in your home. For example, the existence of a basement or crawl space (instead of a slab foundation) will be a significant determining factor in choosing which mitigation system is needed. Clean Air Act, Inc. also provides multifamily radon mitigation in compliance with the HUD Radon Policy. If testing confirms radon levels above 4 picocuries (pCi/L), mitigation must be performed by a radon professional reduce the level of radon gas in the air to a safe amount. The stack effect refers to the natural movement of air (and radon gas) in your home, which moves upwards in a way similar to air moving up through a smoke stack. This phenomenon pulls air up from your basement, crawl space, and/or lower levels, pulling it upwards through your living space and out through the attic and upper levels. By depressurizing the soil beneath your structure, you minimize radon gas' participation in the stack effect. Next, a hole is drilled into the concrete foundation slab, basement floor, or surrounding earth to create a suction point (multiple suction points may be necessary). 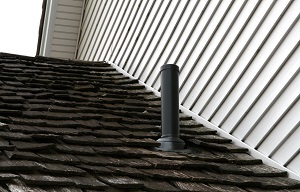 Once through the hole, the radon gas travels through a connected PVC pipe that either runs through the house or outside of it. Radon gas is vented through this pipe to a fan located either in the attic or along the top of the structure. From there it's directed out of the pipe and harmlessly away from your home. To prevent radon gas from continuing to seep into your home, all pathways, including cracks, gaps, and openings, are sealed with a urethane caulking compound. Once the radon system is installed, your technicians will perform a complete system inspection. This comprehensive inspection is done to make sure the radon mitigation system functions according to current industry standards, providing the protection your family is counting on. Your specialists will make sure the radon system is labeled properly, confirm that the fan is functioning properly, and check over other key system details. Within 30 days of the completed installation, your radon levels with be retested. This ensures that your system is working effectively, and that radon levels are not being maintained at recommended levels. A radon mitigation system will protect your entire home from radon gas. At Clean Air Act, Inc., we know that radon remediation is not always a budgeted household expense, and we'd like to work with you to achieve the best value within your price options. To this end, we offer a variety of payment options for your convenience that will help you begin the process of controlling radon and transforming your home into a safer, healthier space. To learn more about how we can customize a radon mitigation system, contact us by phone or e-mail today! We'll work with you to schedule a radon test or receive a free radon mitigation system quote at a time that's convenient for you! For additional radon abatement information, visit our parent network, National Radon Defense. 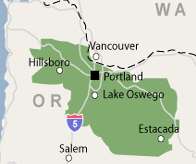 We proudly serve Lake Oswego, West Linn, Tualatin, Clackamas, Woodburn, and nearby.